I'm pretty sure this is the first time Optometry has become a part of my reading experience. Dr. Georgia Young's career as an optometrist is what caught my interest in reading the novel, I Almost Forgot About You by Terry McMillan. Next, the title caught my attention. I like saying the words "I Almost Forgot About You." I do admit that at first the title seemed like a tongue teaser. Lastly, I liked Georgia's reinventing herself. I don't know whether reinvention is a true psychological term, or did it come from the pages of Psychology Today? 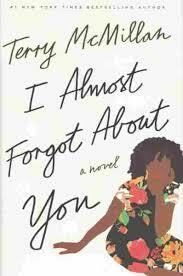 Finally, I'm into "I Almost Forgot About You" by Terry McMillan. I was still lost in the world of "Who Asked You?" by same author. Now, I have all these wonderful quotes and themes popping up around me from the author's newest novel. After thinking about friendship for a little bit, I'm thinking about courage while tasting the slice of Key Lime pie beside me. Yes, courage always alludes me while cowardice finds me with ease. While reading "Your People Shall Be My People by Don Finto, I think of unity between people more than disunity. Peace will overtake the world. Israel will become one with Jesus, as the Jewish King coming down through the line of David. This nonfiction book emcompasses more than my individual salvation. It involves nations. It's evangelism on steroids, if I may use that term. Don Finto realizes the importance of amity between people who are truly related to one another in one way or another way. The book is about the beauty of love, for example, shared between a Palestinian and a Jewish man or woman and their children. 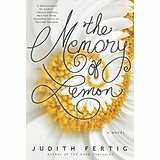 Judith Fertig in "The Memory Of Meringue" writes so much about the flavor of lime, I'm now craving lime. I've never yearned for lime. My favorite flavor is lemon. Let's see in this one paragraph she writes about "April's lime and coconut theme...lime buttercream filling...lime cookie straw...lime bars...lime curd..."
I've liked lime Kool-Aid which I haven't drank in years. I've liked lime punch. I've never tasted the age old Key Lime pie. I can't remember the last time that the taste desire has been so strong within me. Should I try to bake a Key Lime pie? No, I'll start small. I'll have a cold lime drink today. Love by Tina Chang My mother now is taking her sheers and cutting through live shrimp. When I was a child she peeled each flushed grape until only the pale fleshy bead remained. She placed them onto a plate in one shining mound, deseeded, in front of me. I've read a few novels lately where authors use the words "throw up." I hate it. I can think of regurgitate, chuck up, but nothing else. Lo and behold, Terry Mcmillan uses a squeaky clean term. I like it. She uses the word "purge." Nice, it doesn't present such a nasty picture in my mind. In Deadly Currents by Beth Groundwater, Mandy Tanner says she can't imagine not living by a river. She is a character who lives near or on the Arkansas river. Her words really struck me. I know rivers are pretty. I just never thought living by one could dramatically change my outlook on life. It seems Mandy would feel very sad without that flowing river nearby. I'm just the opposite. When thinking of living by a river, I only think of flooding. Obviously, I need to look at rivers more closely and see them in a more positive light. I would like to follow a river by seasons. Mandy says, there are "myriad plants" by the river. What colors? Any herbals? Wildflowers? My mind can't imagine. Yes, rivers are in my thoughts today. 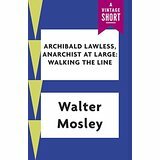 Archibald Lawless is a complicated character in the short story, Archibald Lawless, Anarchist written by Walter Mosley. He works outside of the law with I would say his personally picked vigilante team or workers. To me, he became like Robin Hood. He works for the good of others but not without helping himself to the goodies like money, etc. In this instance, he hired Felix Orleans, whom I liked. He's a journalist student hired by Archibald as a scribe. Felix becomes more than a scribe or secretary. He meets strange characters. He ends up in prison. He's innocent. Holds the man's head, Lansman, thinking he had a Heart attack. This guy seems so weird. His name is Archibald Lawless. I love the way Walter Mosley describes him, his office, etc. Before the end of the story I might end up hating him. "The man standing there before me had no double in the present day world or in history...The wall to my left had a series of shelves that held various oddities." toy chestchild's baby dolla rattlesnake suspended in fluid in a large jara parchment scrolla human skulla stuffed animala necklacepieces of glass represent "emeralds and rubies" I didn't name every item. There is more stuff in the office Walter Mosley writes that isn't named in the list. What kind of guy other than a professor keeps these types of objects and walks around barefoot. I have been thinking about purpose. Cristobal Krusen's purpose of the book is to share the lives of people whom we might know, but we might not know their Faith background. They Were Christians by Cristobal Krusen is about Christians who lived lives of purpose. There is Frederick Douglas, Florence Nightingale and Dag Hammarskjold. Dag Hammarskjold served his purpose as a Secretary-General. Sadly, he died in a plane crash. Then, there is Frederick Douglas. He was determined to become free through his bravery and belief in God. 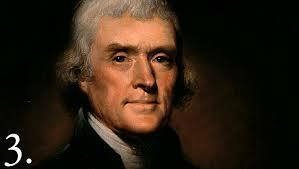 In the end, he became a public speaker speaking against slavery, and he became a newspaper publisher, etc. In The Beautiful Thread, I first became excited about meeting Madeleine and William and Brother Conradus again and others of St. Alcuin's Abbey. Then, I became happy about an upcoming wedding with Rose, Madeleine's mother, as a helper. 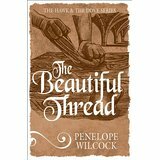 Then, Penelope Wilcock's The Beautiful Thread introduced the friendship of Abbot John and Rose. It's such a wonderful friendship. So, it is again Yorkshire in the 14th Century at the St. Alcuin's Monastery. The book is emotional. When is love not painful and exciting, a mixture of everything? The love between Abbot John and Rose led me to think and ask questions. Is it wrong for people who give their life to God to fall in love with another person? Is it ever possible to have a close friendship without thoughts of passion? Is the emotion of love between two people simply too powerful for any of us to control? Should a person worry about how their friends will feel about their relationship? In Red Cedar, California, there is trouble. Teens at the high school are going against the rule to get what their heart desires. Priorities of parents and teens is definitely out of order. The big prize is Stanford University. The question is what should you or what should you not do when you want something so badly, and you don't meet requirements. Nerdy Birdy, Manny, Mark and two graduating students who are dating one another are some of the characters involved in this shameful situation that ends in murder.